Jaipur, April 12: Mahendra Singh Dhoni's 100th Indian Premier League (IPL) win against the Rajasthan Royals (RR) was marred by an incident where he lost his cool dramatically towards the end of the game, leading to former players criticising the move. 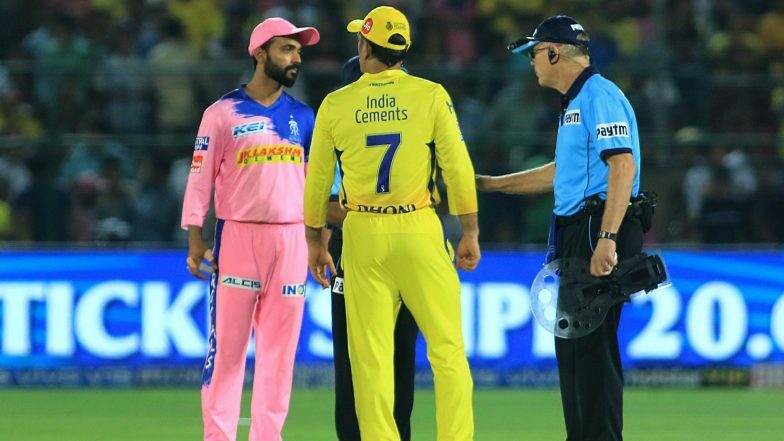 MS Dhoni Fined After Altercation with Umpires During RR vs CSK Match in IPL 2019. The Chennai Super Kings (CSK) scripted their sixth win in seven games on Thursday at the Sawai Mansingh Stadium here as they gunned down a modest 152 run target in a dramatic final over. Skipper Dhoni scored 58 off 43 balls with Ambati Rayudu (57 off 47 balls) also helping in the run-chase. But Stokes got Dhoni out with a yorker in the last over before a waist-high no-ball to Mitchell Santner was ruled out by umpire Ulhas Gandhe after trying to raise his arm. This infuriated Dhoni as the decorated former India captain stormed inside the ground in never-seen-before scenes and chastised Gandhe before leg umpire Bruce Oxenford asked him to calm down and sent him. Kiwi Santner then hit a six off the last ball to finish the game off in style. Dhoni was later fined 50 per cent of his match fee for breaching the IPL Code of Conduct. 'Captain Cool' MS Dhoni Loses Cool in Final Over of CSK vs RR, Hits Out at Umpire for Retracting No Ball Call. "This is not a good look for the game... No place at all for a Captain to storm onto the pitch from the Dugout," former England captain Michael Vaughan tweeted. Former Australian opener Michael Slater, who was commentating the match, was shocked at what he was seeing in front of his eyes. "I can't say I've seen this (before)," Slater said. "You will never see a captain storm out onto the field to have a discussion with the umpires. Unbelievable." Former India wicketkeeper Deep Dasgupta echoed Slater. "He's got every right to go and speak to the fourth umpire, he's got every right to speak to the match referee ... but walking in while the game is on (is wrong). "Just because you feel you've been wronged you can't go and do things which are not permitted." Former Australia pacer Shaun Tait also lashed out at Dhoni. "You don't walk onto the field. It's not village cricket or under-10s cricket -- this is the IPL," Tait said. RR vs CSK Stat Highlights IPL 2019: MS Dhoni's Half-Century, Mitchell Santner’s Last Ball Hands Chennai Super Kings Four-Wicket Win. "You're a player. I think Dhoni sometimes forgets he's a player. You're not an official, you're a player, you can't control the officials. It was a really bizarre look." "They (Rajasthan) were able to build up pressure right until the end. Once you win games like these, you are able to take a lot," Dhoni said after the win. "But it's important to work on the negatives that have not gone well, while enjoying the win. Otherwise it can come back to hurt us later in the tournament."